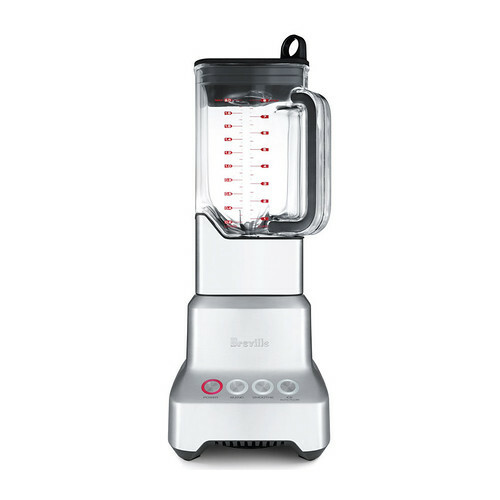 The Breville Die-Cast Hemisphere® Blender — The 3-speed, Hemisphere® Bowl/Blade System cuts right through all kitchen tasks. Blends and chops with engineered efficiency and uniformity. Makes delightfully aerated smoothies. Auto pulsing Ice setting chips ice to the perfect size for drinks. The heavy-duty, dishwasher safe jug rests elegantly on the die cast base, adding a stylish touch to any kitchen. E. Powerful quiet motor with one touch controls Not Shown Surgical grade stainless steel blades. One piece blade assembly designed for easy removal and cleaning.